Crni Lug lies in the Gorski Kotar mountain area. This mountain area is situated in the North of Croatia, in the hinterland of harbour-city Rijeka. Slovenia makes the North border. The most important place of this area is Delnice, a city 12 k. from the village Crni Lug. 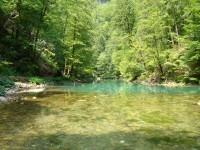 Gorski Kotar is well known for its nature. First of all there is the National Park "Risnjak", a 63 km² big wooded area with some peaks over 1.500 meters. The river Kupa has its source here. The main entrance of the N.P. lies at 2 km from Crni Lug. But there is more than this NP. In the vicinity you can find two big lakes, both used for recreation. Caves (can be visited) are also nearby. The olympic complex with ski runs are available in the winter. Less than 2 hours driving from the probably most well-known National Park "Plitvice Lakes"
Fed up with trees and woods ? In less than an hour you can sunbathe on the beach or swim in the Adriatic sea. Opatija, Crikvenica and other well-known seaside resorts are close by. The historic cities such as Karlovac, Rijeka, Pula and the capital Zagreb are located within reasonable distance. The extraordinary caves in Postojna (Slovenia) are at 112 km or 1 ½ hour driving. The airport of Zagreb is less than 1 ½ hour driving. Transport from airport to Crni Lug can be arranged. Centre of the village with shop, post office, phone booth: 300 m.
Bar Amadeus : 100 m.